Are you passionate about all things space, weather, satellites, and social media? Then this is the event for you. Be a part of the experience! Don’t miss this behind the scenes opportunity to snap, post, tweet, and share everything about NOAA’s newest polar-orbiting environmental satellite, JPSS-1. JPSS is a collaboration between NOAA and NASA that takes advantage of the outstanding capabilities of both organizations. 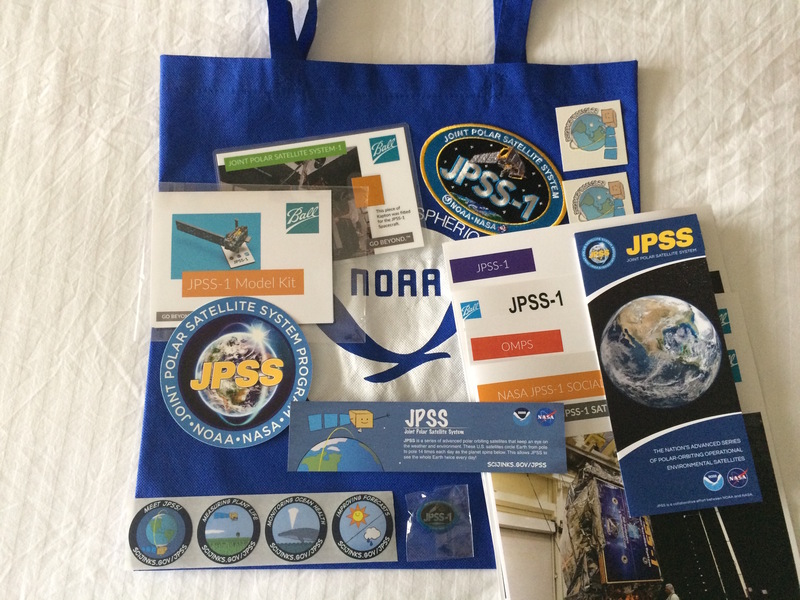 We are inviting social media users from across the U.S. to apply for credentials to join us for a viewing of the JPSS-1 spacecraft in Boulder, CO on June 19, 2017. Don’t miss your chance to get a special insider’s look at the satellite and its science and share it with the world! Although I had attended a previous NASA Social in 2013 (see blog post), and despite the message on the NASA Socials website that previous social participants should “resist the urge to register again and instead allow someone else to have the chance at the opportunity,” I applied again. My essays on how I would use the information from the social in my classroom and would share with others must have impressed the reviewers, as I received an invitation to attend the JPSS-1 event! I was accepted along with other faculty, storm chasers, advertising and media producers, an artist, preschool teacher, undergraduate and graduate students. We were quite a mixed bunch! So I went ahead and made all of my reservations (flight & hotel) – and then, an email came through less than two weeks to the event to say that the schedule had changed, that we would no longer have access to see the JPSS-1 satellite, that the entire day would be at the NOAA facility in Boulder, and project scientists would join us there for a panel and an opportunity to see models from the project. This was disappointing to me, as seeing a satellite in a clean room would have been so cool(! ), but to have the opportunity to tour the NOAA Earth Systems Research Laboratory (ESRL – a source of much data I use with students in my courses) and to still meet JPSS-1 scientists was an opportunity I couldn’t withdraw from. So when the time came, I packed my bags and headed to Boulder, Colorado. The night before the social media social, I made sure I brushed up on the basics of JPSS-1, the Joint Polar Satellite System. I read about JPSS-1 being an interagency effort (NOAA and NASA), that it is a part of the latest generation of U.S. polar-orbiting, non-geosynchronous environmental satellites. I learned that NOAA’s JPSS satellite mission provides critical environmental satellite data to support NOAA’s mission to understand and predict changes in weather, ocean, coasts and climate. The satellite is designed to last for seven years, but additional JPSS satellites will be launched to overlap the time of data collection until the year 2038. Here are two videos (produced for two different audiences) that describes JPSS. 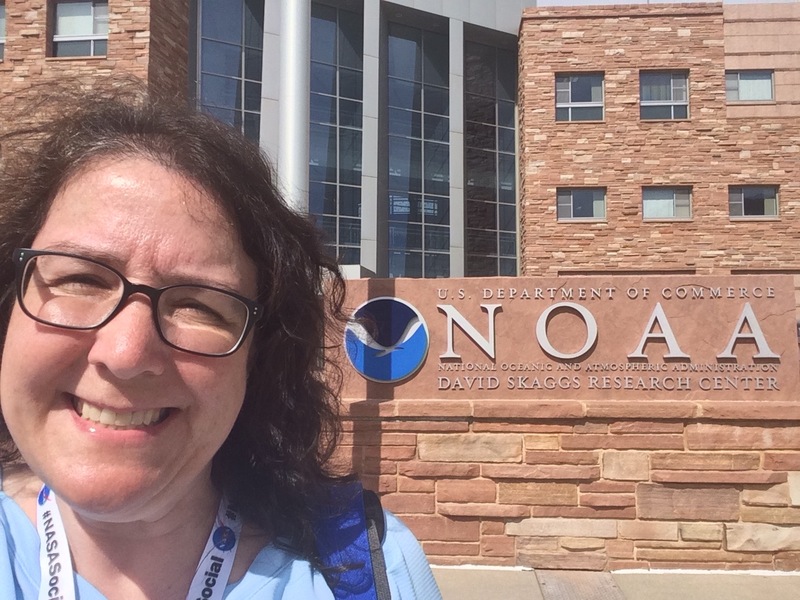 On Monday, June 19th, I was picked up from my hotel and shuttled over to the NOAA Boulder Lab, formally named the David Skaggs Research Center. There are just under 1,000 employees at this location – 1/3 federal, 1/3 cooperative institute (Univ. Colorado-Boulder and CSU), and 1/3 contractors, with a few NOAA Corps members. All the NOAA line offices except the National Marine Fisheries Service at in this building. There was quite a security process to go through, similar to airport security – except our vehicles were also searched, and we were required to have designated escorts with our group the entire time (no roaming off, no entering of laboratories we were not supposed to enter, etc.). When we arrived in the lobby of the NOAA Earth System Research Laboratory, we were divided into two groups. My group started with a tour of the Space Weather Prediction Center, Global Monitoring Division, and National Weather Service. The Space Weather Prediction Center (SWPC) looks at variable conditions on the Sun and in the space environment that can influence the performance and reliability of space-based and ground-based technological systems, as well as endangered life or health (see more to learn about space weather). Areas such as radio blackouts, solar radiation storms, and geomagnetic storms fall under their work. Their work is critical for looking out for our electrical grid, communications, and satellites that provides us important information such as GPS. In the Global Monitoring Division (GMD), we visited the Ozonesonde Balloon Lab to learn about instruments launched on balloons to measure stratospheric ozone. The JPSS will help with gathering global coverage of ozone data, but the data still needs validation, which is why the ozonesondes will still be launched. The National Weather Service (NWS) has one of their 122 forecast offices embedded in the NOAA research lab and operates for 24 hours a day. Their staff stressed the value of satellites – that because of advances in satellite technology in the past five years, there has been improvement in everything from tornado warnings to cold front monitoring. This office also plays an important role in being ready for “situational awareness” (my new favorite phrase from the day!). They have several screens that show The Weather Channel or Weather Nation, Flight Aware, weather cams, and more. These screens can help NWS assess a hazmat incident on a road to tornado and lightning events. The next three groups we visited included the Chemical Science Division, National Centers for Environmental Information, and Science On a Sphere. The Chemical Science Division (CSD) works to understand the chemical and physical processes of the atmosphere through field studies and utilization of aircraft. Unlike the GMD which monitors atmospheric gas concentrations, this Division looks at chemical processes, properties and reactions in the atmosphere (such as ones that involve ozone). One of their current projects is FIREX, where they are trying to understand the impacts of forest/wildfires on air quality in the western United States, especially as fires are more prevalent in a warmer climate, and with cities building on the edge of forests. With the fires that just happened in Portugal, I could clearly see the connection and relevance of this work. The National Centers for Environmental Information (NCEI) “provides stewardship, products, and services for geophysical data from our Sun to Earth and Earth’s sea floor and solid earth environment, including Earth observations from space.” As “stewards of data,” NCEI will be archiving the JPSS data collected. It is amazing the range and volume of data NCEI oversees – some of which I use with my students! The final stop of the morning was to see Science on a Sphere (SOS). The SOS was invented in Boulder as a way to showcase global data sets. The set-up uses four projectors positioned around a sphere that can project everything from land surface temperatures to the vegetation index to ice cover (there are over 500 data sets in the catalog!). It is the global scale of projection that makes this tool very cool to use. Alas, I don’t have room for a giant sphere in my classroom, but anyone can use SOS Explorer on a desktop computer, and there are numerous SOS videos available to view. After lunch with some people from United Launch Alliance (ULA), the group had a couple of presentations from Greg Mandt (JPSS Program Director) and Alex Chernushin (JPSS-1 Program Manager, Ball Aerospace). Below are some images from their presentation that supplement what is on the Ball Aerospace JPSS-1 website. We also heard from a project panel and had time to see exhibits of models of the instruments that will be on board the JPSS-1, talk with project scientists. And before we left, we were each presented a cool swag bag! JPSS satellites increase the timeliness and accuracy of forecast three to seven days in advance of a severe weather event. NOAA’s National Weather Service uses JPSS data as critical input for numerical forecast models, providing the basis for these mid-range forecasts. These forecasts allow for early warnings and enable emergency managers to make timely decisions to protect American lives and property, including ordering effective evacuations. NOAA’s polar satellites are critical to the infrastructure and economy. Polar satellites provide critical weather forecasting for the $700 billion maritime commerce sector and offer a value of hundreds of millions of dollars for the fishing industry. The satellites provide critical information for drought forecasts. Drought impacts are the greatest natural hazard – estimated to be $6-8 billion annually in the United States – and impact agriculture, transportation, recreation and tourism, forestry and energy sectors. NOAA satellites can also observe volcanic eruptions and track the movement of ash clouds – at a value of $100 to $200 million to the aviation industry. JPSS data benefits industry including but not limited to: emergency management, agriculture, aviation, maritime transportation, commercial fishing, shipping, recreational boating, land transportation, defense, coastal community preparedness, land and ocean tourism, energy, construction, insurance, and conservation. I generated a Storify from tweets by myself and others that attended the event. I hope you have enjoyed learning about the JPSS-1 and follow it from launch to its renaming as NOAA-20! (*Note that the JPSS-1 will be renamed NOAA-20 once it is in orbit and operational, being the 20th operational polar satellite for NOAA) And my take-home message for students… even if an opportunity you have been presented changes itself, still go into it with an open mind, as you can still learn much from information you are presented (and still share what you’ve learned with others!). Selfie at the NOAA Boulder Lab!